Kuroge Wagyu, Cucumber, Honeydew, Lime Sugar – Alinea cookbook recipe, pages 78-79. I must admit that this was the first Wagyu steak I had ever prepared. And according to my family, it turned out to be the best steak they’d ever had. Others have completed their versions of this dish, including Allen Hemberger and Carol Blymire. So it was inevitable that I try my hand it! You can’t go to more than a few restaurants here in Southern California without encountering the indigenous “Kobe beef slider.” Unfortunately, they are usually made with cheaper American “Kobe-style” beef, sometimes mixed with regular ground beef. You never really know. Kobe beef comes from Wagyu cattle raised in the Kobe district of Japan. To be called “Kobe” beef, it must come from there, just as “Roquefort” bleu cheese must come from Roquefort, France. Technically speaking, there’s no such thing as Kobe beef (as far as a specific breed is concerned), it is merely the shipping point for beef from elsewhere in Japan. What is called “Kobe beef” comes from the ancient province of Tajima, now named Hyogo Prefecture, of which Kobe is the capital. Real beef connoisseurs, however, still refer to it as Tajima beef. This beef comes from an ancient stock of cattle called “kuroge Wagyu” (black haired Japanese cattle). 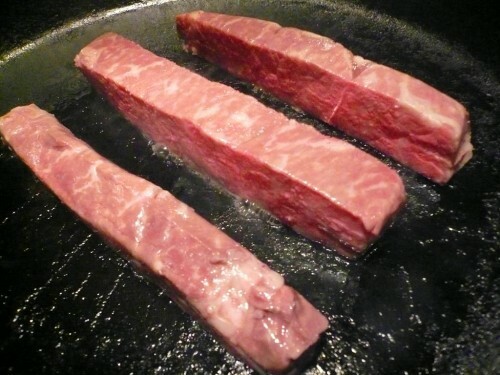 The really funny thing about “Kobe” beef is that you can’t get it here in the United States. Nope. Illegal to bring into the U.S. Kinda like foie gras in California. 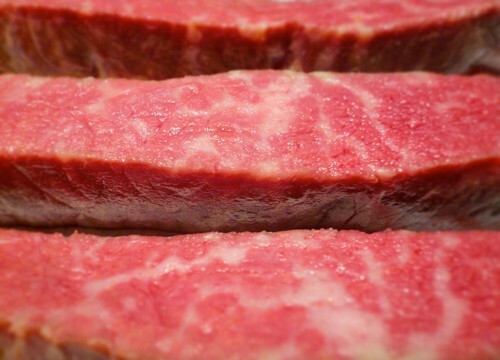 So any kobe beef you’ve had — or thought you had — was not. American “Kobe-style” beef does not come from Kobe Japan at all, but from cattle bred (somewhere down their ancestral line) with Japanese Wagyu, thus the less expensive price. More shockingly, the word “wagyu” in this case generally refers to all Japanese beef cattle. “Wa” stands for Japanese or japanese-style and “gyu” means cattle. 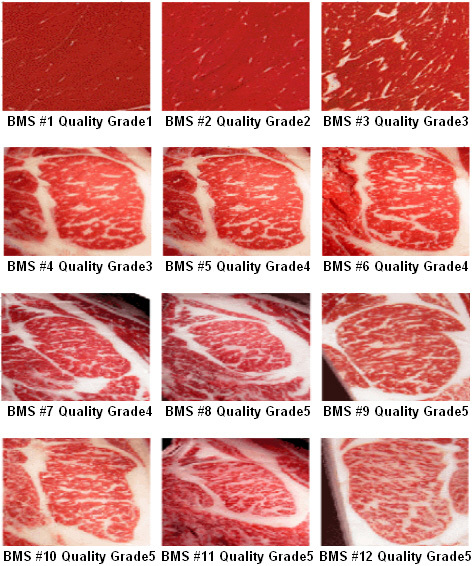 Legitimate producers grade their beef by marbling (BMS – beef marbling standard), color (BCS – beef coloring standard), texture/firmness, and fat (BFS – beef fat standard). So what are you really getting, and do you care that you are probably being ripped off? All I really know is that it tasted grrrrreat! I found some “Wagyu” style beef at a store here in La Jolla named Jonathan’s Market. They’ll usually have the higher-end gourmet items there. One steak was about US$44.00, and that was plenty for this meal. Did not really feel like buying a full-on Wagyu beef cap. Seriously. 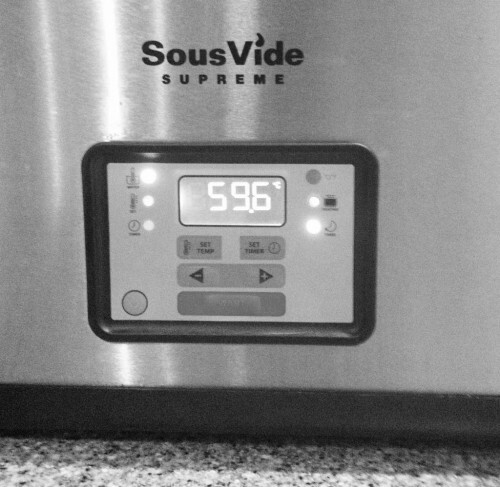 I cooked it en sousvide in my SousVide Supreme water oven, which btw, I’m really diggin’ right now. It’s been working like a charm. On a side note, when we were in Chicago for the NRA Show (food not guns), I stopped by the Eades Appliance Technology booth and chatted with founder Mary Eades and president Rex Bird about their SousVide Supreme. The units are selling briskly, they continue to improve their design, and professional models are being planned. In a fascinating spin on the current sous-vide boom, the introduction of sous-vide infused cocktails is becoming more popular. That’s what I’m talkin’ about! Then cooled in an ice bath. Cut in strips, ready for searing, and refrigerated until needed. 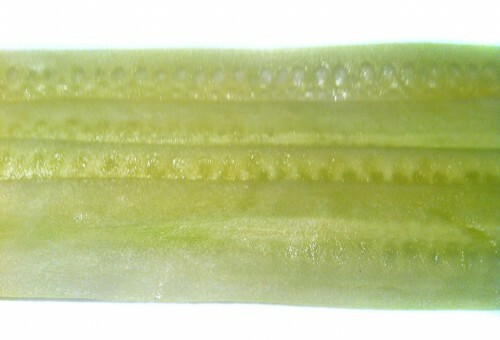 Again, as with the cucumber, easy. 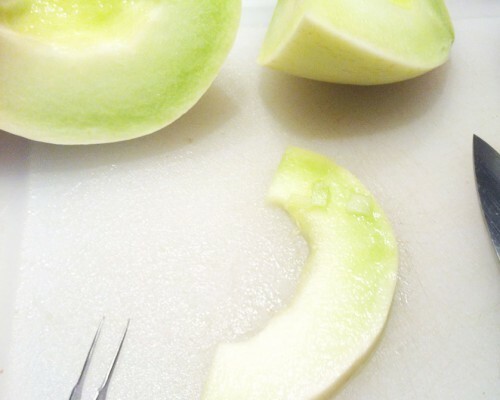 I peeled and seeded a fresh honeydew melon, then cut it into thin planks. The only thing to keep in mind is keeping the width of your beef, cucumber and melon relatively uniform so they’ll match up at assembly. This ended up more like a lime taffy, rather than a crispy lime sheet, probably because I didn’t follow the instructions. See what happens when you go rogue? Still tasted okay, though. I did not have lime oil, so I boiled down some lime zests in sugar and water, hoping for the best! Then I combined some sugar, egg whites, citric acid, lime juice and my lime syrup, whisking until it was a thicken, pale white. Slated to taste. The recipe says to now put this in between two sheets of teflon-coated paper – of which I had none. So, I smoothed it out as thinly as possible onto a silpat mat in my dehydrator. I use the low-sodium form of soy sauce whenever it’s called for in a recipe. 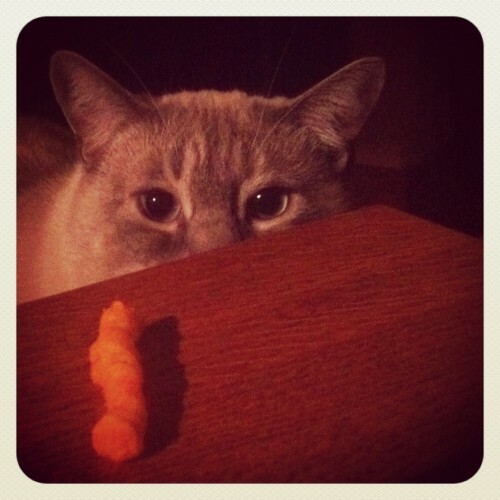 Don’t know if I’m noticeably reducing any threat from high sodium, but I do it anyway. Regular strength Kikkoman soy sauce (red top) has 920 mg. of sodium per tablespoon, while its reduced sodium version (green top) has 575 mg. per tablespoon. Well, that sounds a lot better — until I remember that 1,500 mg is the max daily amount I should be consuming at my age. I heated the soy in a medium saucepan, then added the agar agar and blended with an immersion blender until incorporated. 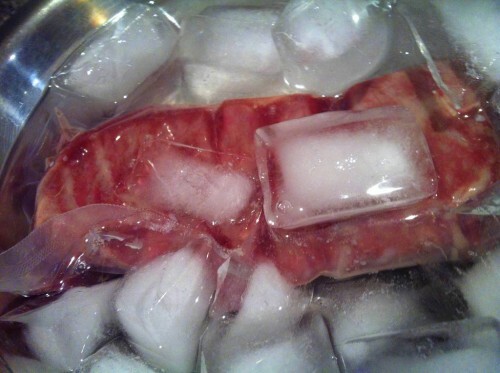 Then strained, set aside to cool, and refrigerated. Later, I blended it in my Oster bar blender until it thickened up some, and finally transferred the stuff to a small squeeze bottle. I didn’t have any just pink peppercorns, so I picked out some from a bottle of multi-colored pepper I had oon-hand. I bit of work, and silly. But why buy a whole another bottle? 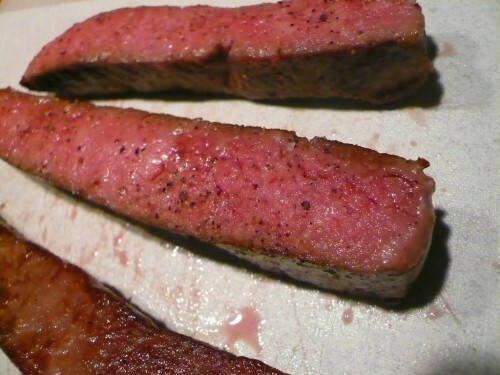 Salt and peppered the wagyu strips, then seared in a large cast iron skillet. 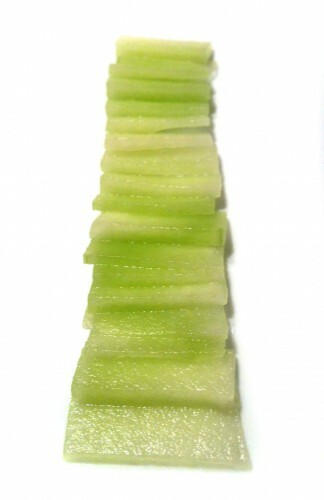 I laid out the melon slices in a row. We also had some steamed green beans (that’s why they’re in the photo – not part of this recipe). 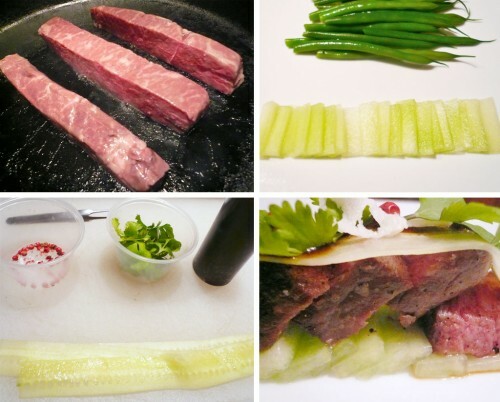 Then sliced the beef and layered over the melon, then added the thin cucumber strip over it. I laid a bead of soy pudding along its length, and a pool of the stuff at each end. Then topped with pink peppercorns, bit of the lime sugar sheets and fresh cilantro leaves. Beautiful presentation. Delicious dish. Gotta do this one again! Yields: 4-8 servings, depending on the amount of beef you use, with a bit of soy pudding left over. This entry was posted in Recipes, Spring. Bookmark the permalink. Loved reading that one….ive still not had the proper wagy experience, ive had the opportunity but really cant justify the price. A friend of mine , fellow blogger Hungry Hoss has just paid £ 180 for a steak…highest grade possible. He said it was heavenly , i just say its madness. its all on his blog , worth checking out.